Dr. Anaizi is an assistant professor of Neurosurgery at MedStar Georgetown University Hospital, a member of the multidisciplinary skull base surgery team and a specialist in minimally invasive neurosurgery. He completed fellowship training at the University of Cincinnati (Mayfield Clinic) in skull base surgery and minimally invasive treatment of a variety of brain conditions, including the full spectrum of brain tumors. Additionally, Dr. Anaizi completed advanced training in minimally invasive spine surgery at MedStar Georgetown University Hospital. 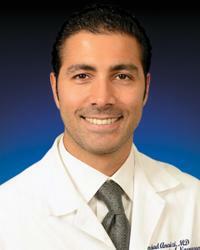 Dr. Anaizi has conducted extensive research in brain tumor treatment with numerous articles in peer reviewed journals. I understand how frightening the prospect of brain or spine surgery is for my patients. It is my responsibility to help them understand their conditions and offer clear and detailed guidance so they can make informed decisions about their surgical options. I recognize that these decisions are not easy. I treat my patients as I would treat my own family, when I counsel them on their options. I explain that surgery is considered only when nonsurgical interventions are not appropriate or have been unsuccessful. I want them to feel comfortable and safe. If they decide on surgery, whenever possible, I provide minimally invasive treatment that reduces risks and allows my patients to recover quickly, and return to their lives. My goal is to improve my patients’ quality of life.